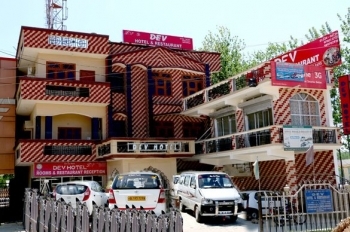 Hotel Dev is a two star budget hotel centrally located in the holy city Haridwar. The hotel is set up in serene surroundings and offers picturesque view which creates a relaxing peaceful ambience. The property also boasts a manicured garden which is perfect for leisure activities or just sipping a hot mug of coffee in the company of nature. 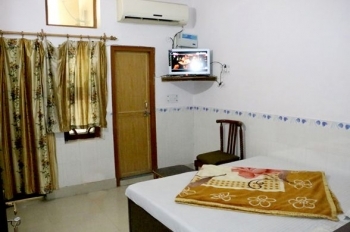 The hotel is located opposite famous Patanjali Yogpeeth on NH 58 in holy city Haridwar. The hotel is at a walking distance from Railway station (100 mts), Bus station (150 mts) and with a distance of 200 mts only from holy Ganga. The offers a nicely built anf fully furnished set of 22 rooms. The rooms are categorized into : Ordinary, Standard, Executive and Deluxe Rooms which comes with all modern amenities like colour TV, laundry bag, luggage space, private bathroom, telephone and in-room menu. The hotel owns a well lit restaurant which offers pleasing ambience, friendly staff, spacious interiors and delicious food rendering a memorable dining experience to the guests. It serves a variety of cuisines cooked by expert chefs offering the services without any time boundation. Dev hotel has well connectivity with metalled road. Located on the Haridwar - Roorkee highway, one can reach easily from both sides, either Roorkee (12 km) or Haridwar (13 km). Both cities have railway stations connected with same rail line. Nearest airport is at Dehradun Jolly Grant Airport (52 kms).